Richmond, VA - April 25, 2010 - Kaleb VanOrt of Mishiwaka, Ind., and Amy Farrell of Saranac Lake, N.Y., outlasted a record field of nearly 1,300 participants, including Travel Channel and NFL star Dhani Jones, to claim overall national titles Sunday at USA Triathlon's Duathlon Age Group National Championship. The Iron Mountain Multisport Stage Race is unique new concept in Racing. On Saturday (4/24) evening there will be a Sprint Triathlon event. A little over 12-hours later on Sunday (4/25) will be a duathlon. Together they become the Iron Mountain stage race. It saddens us to announce that we have lost a longtime River Runner and a good friend. Thorpe Running passed away Friday, April 23rd. Thorpe had a bike accident about ten years ago that left him paralyzed from his neck down. Thorpe continued his work as a professor and never gave up.Our condolences go out to Cheryl and the Running family. 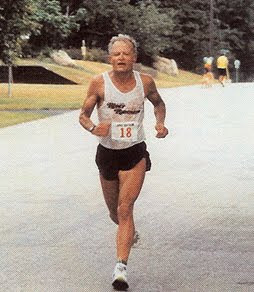 MTN NOTE: A wonderful and courageous man who was one of our state's most talented masters endurance athletes before his tragic accident, Thorpe Running, for whom the Thorpe Running Inspiration Award was named, was 69. Services will be Friday, April 30 at Bethlehem Lutheran Church in St. Cloud.